Ace Crane offers a complete line of Chain and Wire Rope Hoists that can fit almost Any Application and Budget. While it is difficult to have our entire line of hoists online, below are the hoists that we offer that fit 90% of the applications for General Industry. 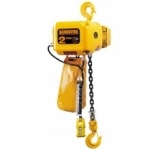 Please call or email us with your application requirements so that we can provide a hoist that fits your application.